It's been an amazing month! Just a couple of weeks ago KeyTours, the leading tours agency in Greece, was recognised among the best in Greek Tourism. Every year, the top players in the industry participate in an award ceremony, which aims at highlighting the tourism practices that made an impact throughout the year. 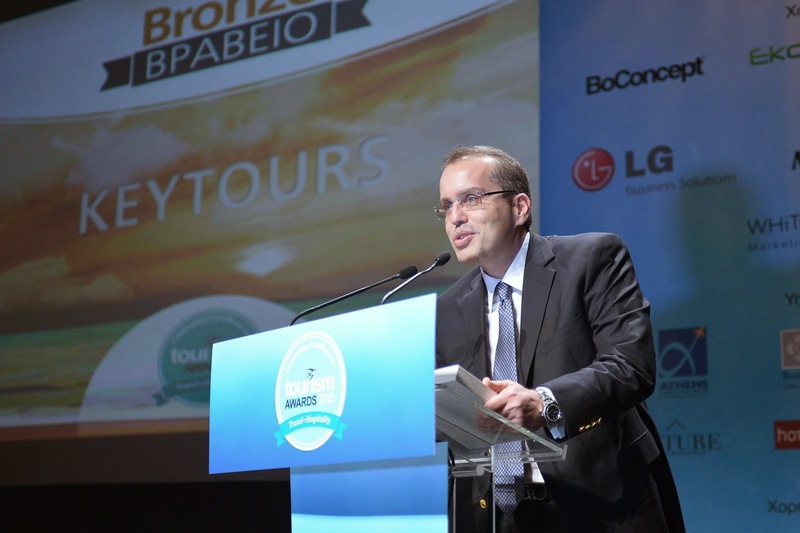 This time, on the 2015 Greek Tourism Awards, held at Megaron Concert hall, on March 12th, KeyTours was awarded in two different segments, showcasing the great work and effort that has been given into our tours and online presence. KeyTours’ Heritage & Cultural tours were honored with the Bronze Cultural Tourism Award, for their broad range and well organised planning. When KeyTours first put together ideas and sights that would make up for heritage tours, our aim was to teach about the culture of Greece from the antiquity to modern days, leaving the old “Acropolis -Delphi -Knossos” stereotype, digging deeper into the Greek history and culture. We are extremely happy our efforts were noticed and ultimately won an award at the prestigious Tourism Awards. Our second award for the night was on Digital and Social Marketing on the SEO and SEM Practices. It’s true that at KeyTours we soon discovered that tourism, as an industry, goes more and more digital every day. Instead of our previous tour sales model we needed to embrace the changes the rise on broadband brought and go on a full digital campaign. Our partners at Nelios, were happy to help and they created a complex system of thousands of possible keyword combinations to create a unique ad campaign that tracks every specific search query and promotes a different, but relative tour ad.It is with great honor and responsibility for next year, that we accept these two Tourism Awards for all the hard work that has been done in Digital & Social Marketing and in Cultural Tourism.